Kerala SSLC exam results 2015 will be published today at official websites www.keralapareekshabhavan.in, wwww.results.kerala.nic.in, www.keralaresults.nic.in, www.results.itschoool.gov.in and www.prd.kerala.gov.in. After the Kerala SSLC exam results 2015 get announced (declared), the results will be published at various websites owned by the state government. State Education Minister P. K. Abdu Rabb will announce the results today at 4 PM. 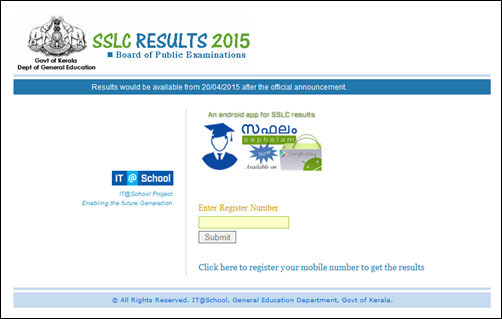 The Kerala SSLC examination results 2015 will be announced on Monday. State Education Minister P. K. Abdu Rabb will announce the results today at 4 PM. This year, a total of 4,68,495 students had appeared for the examination. The Examination Board will meet on Monday morning to finalize the results. With the evaluation camps set from 31st March 2015, the scrutiny of the papers ended on 16th April 2015. The tabulation was finished at a record pace as more valuations centres were added than previous year. In 2014, the state registered 95.47 per cent win. The state education department has set up all arrangement to deliver the results on time. Apart from various websites managed by the Education Department, government call centres, SMS facility and mobile app would facilitate the students to know their results. Students and parents can use the Citizen Call centre to get the results. Additionally, www.examresults.net has launched a Android Mobile App completely dedicated for students to get their exam results. Students can download the app from the website or go to the URL http://bit.ly/Exam-Results-Mobile-App. The SSLC results for the year will be available in various websites which are managed by the education department. Kerala SSLC 2015 school wise exam results can be known through school codes. The Kerala SSLC 2015 school codes of Alappuzha, Ernakulam, Idukki, Kannur, Kasaragod, Kollam, Kottayam, Kozhikode, Malappuram, Palakkad, Pathanamthitta, Thiruvanathapuram, Thrissur and Wayanad will help to check the results online along with the complete list of students and their marks. Kerala SSLC Result for the academic year 2015-2016 will be published on April 27 2016 at 11.30 AM by General educational additional chief secratary Shri. V. S. Senthil. The SSLC Results 2016 will be available at various official websites thereafter. Check your SSLC Result (10th class result) and download mark list from official website of Pareeksha Bhavan and the official NIC provided Kerala exam result pages. Read here to get details about how to get and where to get the Kerala SSLC result 2016.